Incorporating a continuous air barrier into a building's design and construction can save energy and improve the indoor environment, among other benefits. 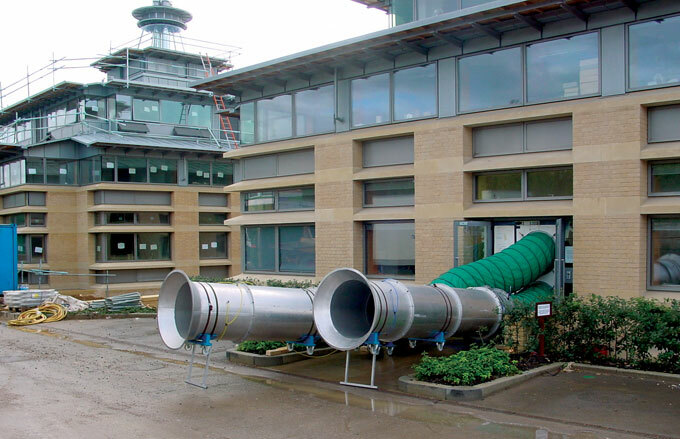 Air-barrier specifications and testing are required in Great Britain, where this blower-door test is taking place at a new commercial building. Large blower doors like these depressurize a building, allowing air-leakage testing. Air leaks may not be as dramatic as water leaks, but they cause plenty of problems. When a new LEED-certified building in New York formed icicles and ice dams, the owners brought in building-science consultant Terry Brennan of Camroden Associates to investigate. “The detailing of the air barrier was actually pretty good,” he says. The rafters are sealed with rigid-foam insulation taped at the seams, and the walls are sealed with gypsum board and a polyethylene vapor barrier. “But where they came together there was nothing in the drawings and nothing in the specs,” he told EBN, “so it’s got this crack.” With an eighth-inch (3-mm) crack running along the eaves, that gap leaks a lot of heated air, melting snow and causing ice buildup while creating the potential for leaks and moisture damage. An air barrier is any material that is impermeable to airflow, including drywall, closed-cell foam insulation, peel-and-stick membranes, oriented-strand board, and many other materials. (It is not to be confused with a vapor barrier, which blocks diffusion of water vapor.) But as Brennan’s story illustrates, making an air barrier for a building requires considerations beyond just the type of material. The air barrier needs to be continuous around the space it is designed to enclose, whether that’s the entire building or a unit within the building. It needs to be able to maintain its function in the face of stresses like installation and damage during construction as well as changes in pressure due to weather and other factors. It should last as long as the building. Air barriers have long been neglected in residential and particularly commercial construction, but new codes and standards, along with a push for better energy performance, are making them more of a priority for all building types. Examples and perspectives in this article focus on light-commercial and multiunit-residential construction, but they also apply directly to single-family residential and large commercial projects.